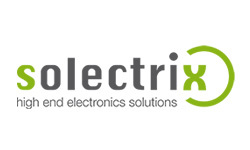 Solectrix, founded in 2005, is an independent service provider specialized on the development of embedded systems. The company’s expertise stems from years of working on medical technology, high-end camera electronics as well as automotive and industrial projects. Services offered range from smaller projects like customized high-speed interfaces to the design of complete systems. Specialties include demanding FPGA designs and digital image processing. Solectrix works closely with Solectrix Systems, founded in 2008 by the same creative core, which acts as a production and sales company.